The first novel by Stephen King that I chanced upon and read some years ago was Salem’s Lot—a book about vampires. It was written well before vampires came back into fashion and I loved it. Salem’s Lot was the first novel that King wrote and the second novel of his to be published. Carrie was the first to be published, and I loved it, too, and have been a fan of King’s ever since. The premise is simple and devastating: Women across the world (all of them!) do not awake after they fall asleep. Is humanity being punished by a vengeful God? Is what is happening a witch’s curse? Is it a virus of some kind? Whatever it is, the public start calling it Aurora, after Princess Aurora in the folk tale, Sleeping Beauty. Key to the story is the one woman in the world who is able sleep and then, afterwards, wake up as usual. Her name is Eve. (Think ‘Garden of Eden.’) She is mysterious, perhaps supernatural, perhaps a witch. She has magical powers. Once again, we gather to remember that eleventh hour of the eleventh day of the eleventh month, when the guns fell silent and the Great War ended. 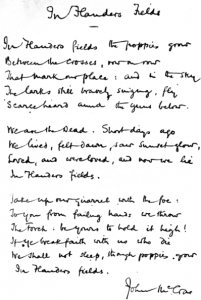 It is time to honour and remember the veterans of all wars and to hear the words of John McCrae’s poem In Flanders Fields recited beside cenotaphs and war memorials around the world. Hemingway believed that, to be a writer, one had to live the ‘writer’s life,’ meaning, for him as a man, one had to go to war, to attend bull fights, to box, and to drink large amounts of alcohol. 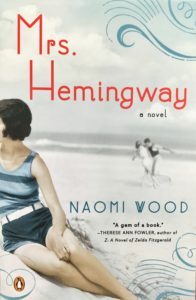 He had four wives in total and, despite the title of Naomi Wood’s Mrs. Hemingway being in the singular, the novel spans all four: Hadley (‘The Paris Wife’ and mother of Bumby), Fife (the writer for Vogue whose real name was Pauline; she showed up in Paris and stole Ernest away), Martha Gellhorn (the war correspondent from both the Spanish war and World War II), and Mary (the American journalist who, like Martha, had experienced the war in Europe). Naomi Wood leaves no alleyway unexplored: the salon of Gertrude Stein, for example, or the bookstore, Shakespeare and Company, beloved not only of Hemingway but also of writers such as James Joyce and F. Scott Fitzgerald. Wood leaves no stone unturned, notably the issue of Hemingway’s suicide. She covers locations—Paris, Key West, Cuba, Idaho—in order, and the reader experiences the great writer from the point of view of each wife, in turn. Wood’s novel will delight fans and would also be an interesting introduction to Hemingway for those who have never read his work. My list of all-time favorites by thriller writer John Grisham includes The Pelican Brief, The Firm, and The Rainmaker. All are about lawyers and the law. 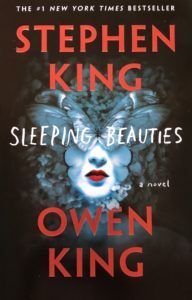 Last week, I read one of his more recent novels: Camino Island (Dell Books, 2018). Here, Grisham firmly breaks with tradition. 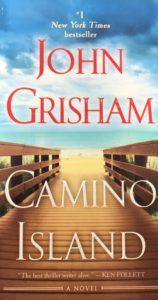 Camino Island has nothing to do with lawyers. It does, though, involve a robbery (of priceless manuscripts from the Princeton University library). It involves a young writer. Her name is Mercer Mann. It also involves a bookshop (on a pretty island off the coast of Florida) and that bookshop’s owner, Bruce—a possible love interest for Grisham to dangle in front of the lonely Mercer. Camino Island does not disappoint. Hardened Grisham fans, perhaps expecting yet another law-firm thriller, will find the book enjoyable and alive with detail. What is it that Rick (played by Humphrey Bogart) says in the movie Casablanca when Ilsa (played by Ingrid Bergman) asks if he remembers Paris? Those lines were spoken in a movie about a memorable time in the history of Paris, the City of Light, which was very much a city of women during 1940—1944, when Paris was occupied by the German army. Anne Sebba has written a remarkable book, Les Parisiennes, describing Paris and the lives of its women during that dark period, les Années Noires. So many Frenchmen had been captured or were fighting overseas or were forced to work in factories, far from home. To a large part, it was left to the women to face the conquerors. Increasingly desperate for food, the women of Paris, whether wealthy or poor, became engaged in the everyday struggle to survive. 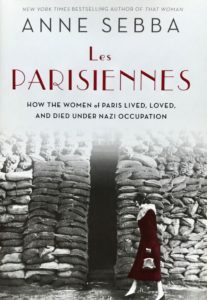 Sensitive as well as thorough, Les Parisiennes records the details of the world of women in wartime Paris, from Elizabeth Arden’s paint-on stockings to the cost of a packet of cigarettes, from French traitors to heroines, such as Odette, and let’s not forget the German women of Paris, the Blitzweiben—so-called ‘little Grey Mice’—who were posted to the city and saw Paris from the eyes of the foreign tourist. Neither does Anne Sebba forget the brave Frenchwomen who perished, nor those who were deported and endured the hell of concentration camps, like Ravensbrück. After the success of the Nazis in the election of 5 March 1933, swarms of Germans scrambled to jump onto the bandwagon by joining the Nazi Party. Such latecomers were termed ‘March Violets’ by the old-time Nazis. 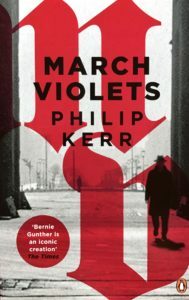 March Violets is the title of the first book in the trilogy Berlin Noir, written by British author Philip Kerr. The trilogy represents the beginning of a long series of novels featuring Kerr’s famous protagonist, Bernie Gunther. The chances are that you already know Bernie very well. If not, you are in for a treat. Bernie is a some-time private eye and a some-time detective on the Berlin police force. In March Violets, the year is 1936 and Bernie is hired by a wealthy German industrialist to investigate his daughter’s death: shot in her bed with her husband; her diamonds have disappeared. This week in the war, on 2 September 1945, Japanese foreign minister, Mamoru Shigemitsu, signed the instrument of surrender on board the battleship USS Missouri, anchored in Tokyo Bay. 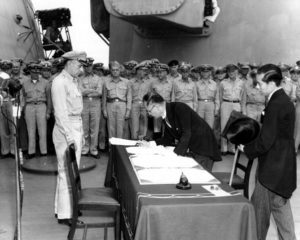 General Douglas MacArthur signed on behalf of the Allies. 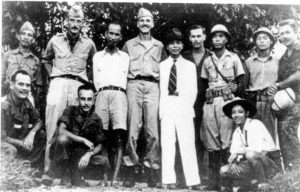 Representatives of many Allied nations attended, including General Philippe Leclerc of France and General Arthur Percival of Britain, the latter having only recently been released from a Japanese prisoner-of-war camp. Also anchored in Tokyo Bay was the British destroyer, HMS Whelp. Its first Lieutenant was Prince Philip of Greece who, in 1947, would marry Princess Elizabeth, the future Queen of England. This week in the war, 20 August 1945: As agreed at the Potsdam Conference, the Chinese forces of Chiang Kai-shek crossed into northern Vietnam (Indochina) to accept the surrender of the Japanese. The Chinese left local control in the hands of the Vietnamese provisional government which was headquartered in Hanoi and led by Vietnamese nationalist, Ho Chi Minh. The Potsdam Conference had assigned the southern part of the country to Allied Southeast Asia command and the British arrived in Saigon with the French, who moved to reestablish their control. This week in the war, on 15 August 1945, Emperor Hirohito broadcast on the radio to the Japanese nation. His broadcast announced Japan’s acceptance of unconditional surrender to the Allies. 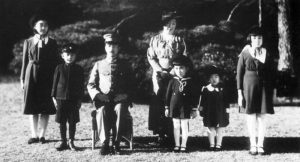 It was the first time that the Japanese People had heard the voice of their Emperor. Late on the night before the broadcast, over a thousand troops attacked the Imperial Palace, hoping to prevent the transmission from taking place. They were eventually driven off and the recording of the Emperor’s speech was transmitted as intended.